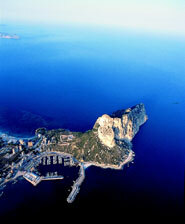 Calpe is coastal resort dominated by the well-known and impressive Penon de Ifach rock. 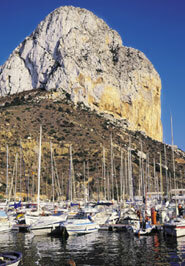 It has been a tourist destination since the 1930s due especially to the quality of its fine sandy beaches and the cleanliness of its waters.Calpe town has a lovely Spanish feel to it and the port area is lined with restaurants where you can sample the fresh fish caught here daily. There are two excellent beaches to choose from, Levante and Arenal with summer rental facilities for windsurf, pedal boats and jet-ski equipment.Many apartments line the beaches and you can always find people strolling along the promenade. 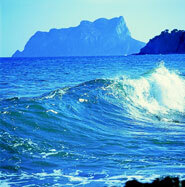 The apartments are mainly holiday or second homes owned by a mixture of Spaniards and Northern Europeans. While the locals tend to prefer town living in urban apartments, visitors who settle in Calpe find that just 5 minutes drive from the centre of town, there are lovely developments of detached villas and complex-style properties many with spectacular sea views. Golf enthusiasts can play at the 9 hole Don Cayo Golf Club found at the foot of the Sierra Bernia.